This project was a collaboration between the University Utrecht and the HKU, for which I joined a team of 5 HKU students. The goal was for us to build a game from the ground up to delivery, and experience the whole process of game design. The HKU students were mainly designing the game and I was mainly assisting with technical contributions (i.e. problem solving and performance issues). Our task was to produce multiple dadaistic games for Fourcelabs, a small game company who focuses on developing pervasive games. Our game design process came forth with fourteen prototypes, of which two were eventually chosen to be fully developed: the Arcrane and Demolition Birds. In the four months we were given to produce the games, we were able to create two games that had a dadaistic and absurdic feel to it. Fourcelabs was very satisfied with this result, especially with their experience of similar jobs for teams that weren’t able to completely finish one game. Some media displaying the final result. Note that they are all in Dutch. If you wish to read more about the game design process, scroll down to my Report on Game Design project. 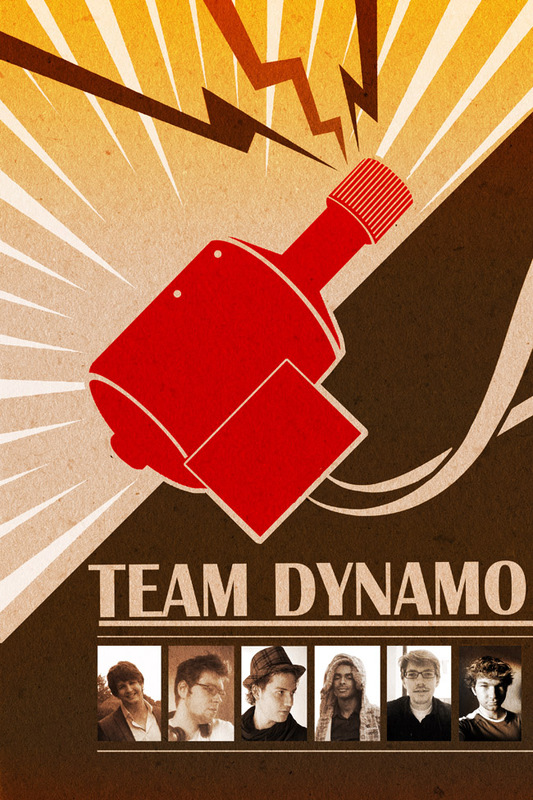 At September the 12th, a group of HKU students and I formed a game design team, which we called Team Dynamo. Our assignment was to produce games with a Dadaistic twist; when you expect something to happen, something else may happen instead, which is often the complete opposite. With this information, we thought of a total of 14 concepts. From these, we made prototypes of the most feasible ones. Four prototypes had potential of becoming a game, of which we chose two to actually make a game of. 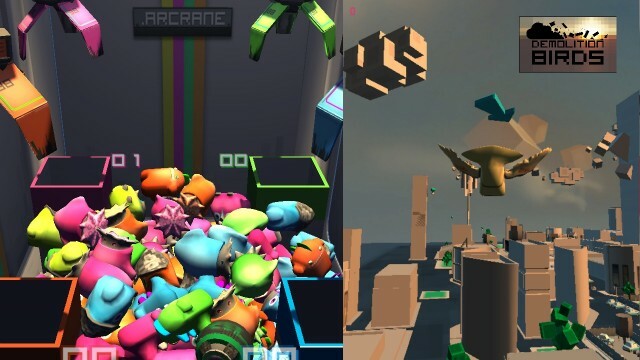 Creating the prototypes and games was often a challenging task, requiring proper knowledge of physics and the game engine’s architecture (in our case Unity3D). In the next section, I shall highlight various technical contributions that I’ve done, in order to prove that I’ve been a beneficial asset to the team. My noteworthy contributions are those related to programming three prototypes and one game. The concept of the installation. The first prototype I started to develop was the bobsleigh. 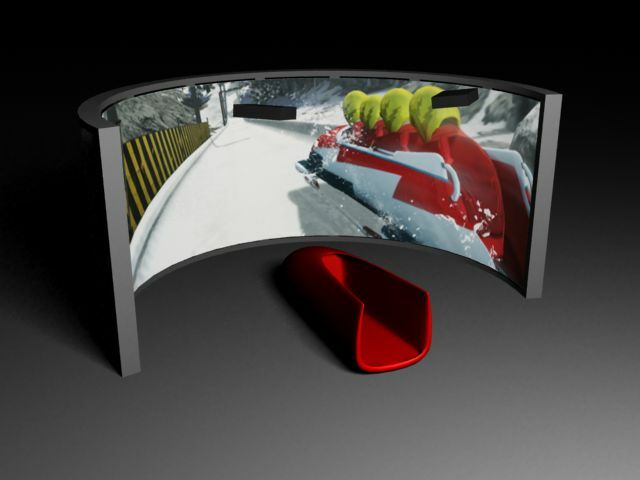 The concept was about multiple players sitting inside a physical bobsleigh, using their body weight to steer their virtual bobsleigh into the right corners. 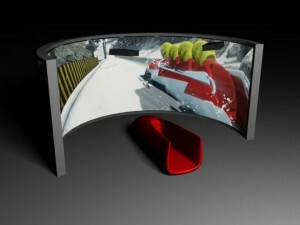 The bobsleigh itself would mostly be affected by the physics engine, with the intent to produce an accurate bobsleigh simulation. I started off with creating a simple sliding block on an equally blocky track, for it was also my firs t experience in working with Unity3D. I tested out various shapes and sizes of the bobsleigh, to see how it affects the way the object acts in a physically simulated environment. In addition, I tested out various track sizes and the properties of the physics engine and the physics of the objects (in Unity3D: PhysicalMaterials). My main objective at the time was to get a good feel of how Unity3D worked, for during this time, my colleagues created a more realistic looking track and bobsleigh than the objects I created from geometric primitives. The new bobsleigh sled visually a lot more realistic through the smoothly curved track, though the physics didn’t exactly perform as expected. The new bobsleigh and track with ramp. One of the issues with the bobsleigh was that it was sliding too much to the side. I was able to solve this by setting the friction of the skates to match that of a real skate: very low friction along the skate, but very high friction perpendicular of the skate. There were more issues, such as the bobsleigh toppling rather easily and the bobsleigh not rotating along the track, but the team leader decided that the time was best spent working on another prototype. Since the bobsleigh game never made it into an actual game, the prototype was never developed further. The fishing game was the second prototype I started development on. The concept wasn’t as worked out as other concepts; no Dadaistic traits were present and the gameplay was simply to fish up fish. There were some ideas about using computer hardware to throw at fish, causing certain effects on them depending on the piece of hardware, but the concept hasn’t been worked out up to that point. 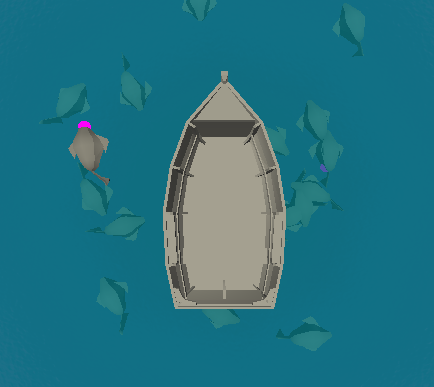 The prototype I created was pond with a boat in it. The fish were spawned at random points in the pond. To make it appear as if a fish is swimming, I picked a random target destination inside the pond’s perimeter and made the fish swim towards it. Upon reaching the destination, a new one is chosen. At certain intervals, a random fish was picked to bite the player’s bait. Baited fish could be reeled in by pressing up; a fully reeled in fish awarded a point, while letting go prematurely made you lose the fish. The technically more interesting part would’ve been the turning of the fish when it is swimming, and to create a physically accurate representation of reeling in a fish. However, it was unsure if this concept was going to make the cut. Therefore it was decided that we would spend no more effort on this concept until we were sure, and I started working on yet another prototype. Later it was decided that this concept wasn’t interesting enough to be turned into a game. Schracen is a combination of “schreeuwen” (“screaming”) and “racen”. The concept was about having two players cooperate at controlling a car by screaming at their steering wheel, which holds a microphone. Depending on the volume of the players’ voice relative to each other, the car steers to a certain side. The work on the car was not lost however. I was able to reuse it for testing purposes for the bird game. The bird game changed a lot since its first concept. 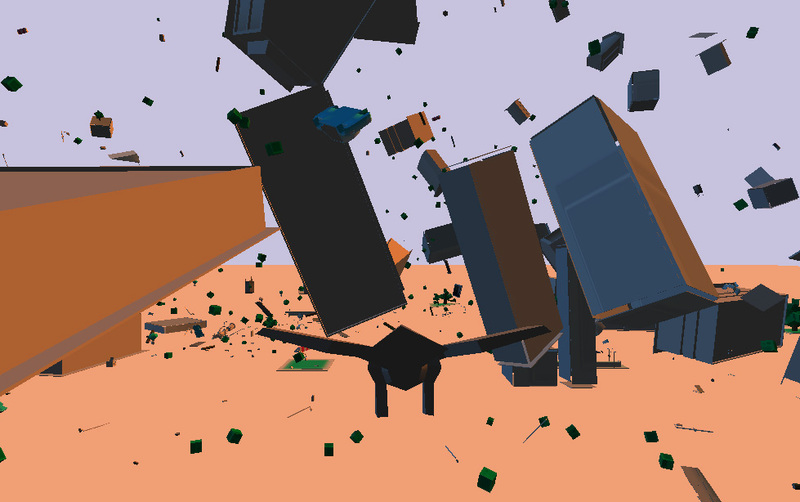 It started off as a single player game where the player would fly around a city. The objective was to fly as far as possible with the limited resources you had. The concept later slightly changed to the game being about an obese eagle being trapped on top of a corporate building. His energy is limited and upon spending it all, he gets a cardiac arrest and crashes down. The objective was to cause as much damage as possible when crashing into objects. For this purpose, a destructible city was created. During testing, we noticed that the destroyed city with all kind of objects floating through the space was a rather trippy experience. This coincidental result, and the additional interaction of the bird with the objects, actually lined up with the desires of the employer concerning the feel of the game. From this experience we created a new concept: it would be a two-player game, where each player tags objects (including whole buildings) by colliding with them. Tagged objects get the tagging bird’s color, and get the ability to tag smaller objects by colliding with them. The colliding of the bird with the objects and the objects with each other was one of my technical contributions. The physics of the city objects falling apart was something that needed to work and look good, for the game relied on that. The city designer created the objects to be separate entities consisting of sub-entities; this allowed me to attach a script to the parent object, and make the object (such as a car) break apart when collision with any child occurs. As mentioned at the end of the Schracen section, I used the car to test several physics setups. Generated colliders, a feature of Unity3D when importing meshes, caused unrealistic physics simulation and was therefore unusable. Instead, the scripted creation of non-convex MeshColliders turned out to produce good effects. The resulting script allowed for any object to become a FallApartObject by attaching the FallApartScript to the parent object (which also added the MeshColliders and child scripts that where necessary). Since the city consisted of hundreds of objects, I decided to group them all under a single City object, and attach a script that would attach the FallApartScript to all of the objects. This allowed for further iterations of the city to be able to fall apart by attaching a single script to the City object, which handled all modifications on its own at startup. The physics collision between the objects and the bird was a tough one. Since the bird has a specific control mechanism to allow accurate steering by the player, physics simulation on the bird is not possible. Tests in which the bird was affected, the bird would become uncontrollable due to the forces the physics simulation applied to it. The physics engine of Unity3D is a little odd in dealing with physics between simulated and non-simulated objects, but the issue was eventually solved by using triggers. The downside of using triggers is that no contact points are generated, so instead I made the bird apply a force based on the current direction of the bird. 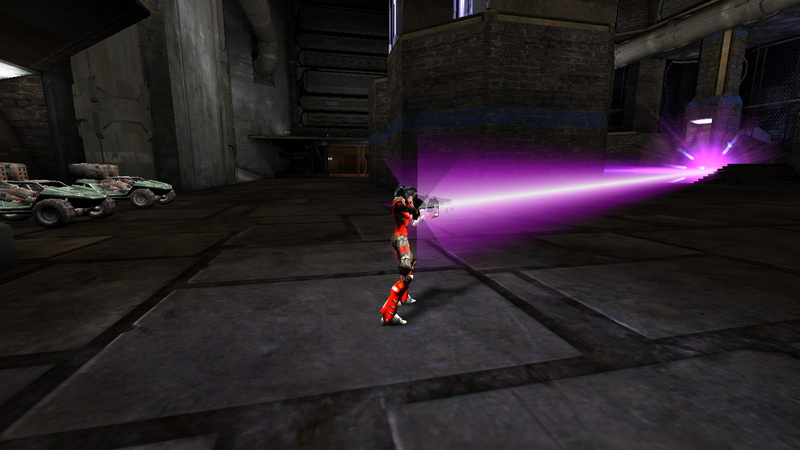 An additional advantage of this method is that the player is able to aim the objects he collides with. As the project progressed, the city that was being designed for the game expanded greatly. The last iterations of the game featured thousands of individual objects (such as car doors), with the final one containing over 2500 objects. When testing these versions it became apparent that when the larger part of the city was physically simulated, the physics engine had to perform so many calculations that it grinded to a halt, and that we could express the framerate in second per frame. We feared that Unity3D was unable to cope with our rich decorated world. However, I was able to recover a good framerate after applying two solutions. The first solution was the use of physics layers. I wasn’t aware of this feature in Unity3D before this issue, but it solved the bulk of our framerate problems. 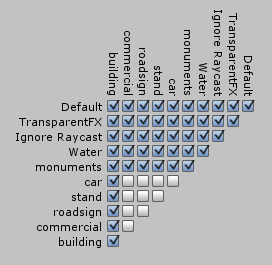 Objects in the game can be assigned to a certain layer. The layer is useful for identification of the class of the object, but more importantly is also used for determining if objects belonging to a layer can physically interact with object of another layer. Combining all possibilities yields a Layer Collision Matrix, which is shown on the right. As can be seen there, some layers have their ‘can collide with’-box unticked. 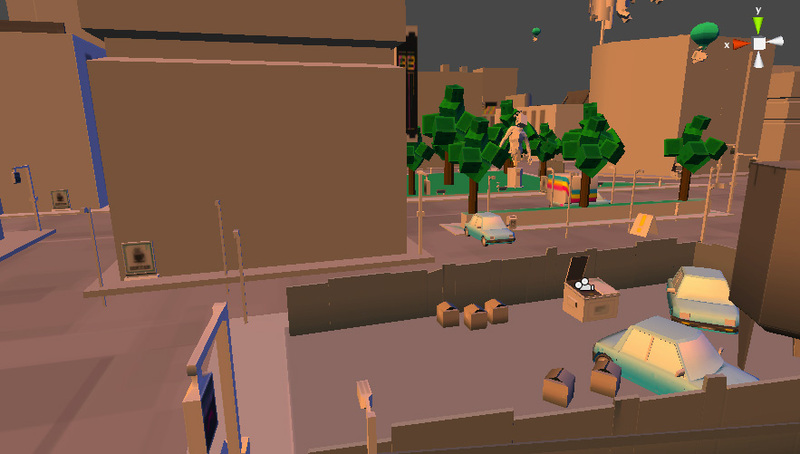 These layers contain objects that are tiny compared to the buildings that are present in the game, and therefore do not require accurate physical simulation. After turning off the collisions between these layers, the framerate rose to a reasonable level. However, it wasn’t sufficient to solve the issue; when nearly all objects were physically simulated, the player still experienced lag. Since the built-in profiler didn’t give good hints on what was holding down the framerate, I went searching for more solutions. This solution solved our framerate problems. Our finely created architecture uses empty objects to group other objects. This is a recommended procedure by the creators of Unity3D, since groups or folders to visually structure objects placed in the game do not exist. But this practice introduces a new problem: whenever a child object moves, its effect on the parent is calculated. What is kept track of I’m unsure, but there is some administration going on, even when the parent is an empty game object that is never affected by anything. And since this game can have various thousands of objects moving around, lots of useless recalculations are made every frame. The actual solution was simple: we needed our City object to keep all objects grouped under, but after starting the game, it has become redundant. Using a small script at startup that calls an existing function called detachChildren() and then deleting the empty and childless City object, the framerate of the game has become excellent. Using the above two solutions, the game is able to simulate 2500+ objects in real-time, while maintaining a high degree of realistic behavior. It was not necessary to reduce the amount of objects present in the city for the sake of framerate, which would have made the game a lot less interesting to play. I even reckon that the game would have failed to deliver if it would have been the case, because being able to create a great clutter of objects was a primary goal for this game. 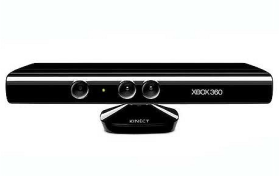 There was one issue that has kept bugging us during the entire production of the game, but never got around to fixing it: each time the game was shut down, the library used for reading the Kinect crashed. After the game got at the final stage and the rest of the team was polishing it up, I decided to try and solve this issue. The library we used for reading the Kinect is called Tinkerer and it came with a wrapper for Unity3D. After searching through the error logs and stack trace, I came to the conclusion that the error lied inside the library. The documentation of the library did not speak of specific shutdown preparations or other functions required being run in order to shut the library down in a clean way. Neither could I find a solution on the internet. Since the final deadline was closing in soon, we decided to use a workaround: the library would simply not be shut down any more. The library is run the first time, and can then be used for consecutive games. It even gave the game a performance advantage: since the library was never terminated, our game could launch quicker. The bird game was successfully finished, and was renamed to Demolition Birds. The Arcrane, a four-player competitive crane game was also successfully produced by our team. Both games were presented to FourceLabs on Friday the 16th of November, 2011. The head of FourceLabs, who is experienced at being a client for HKU projects, commended the team on producing two working games that met quality requirements. Personally, I found the experience of working with HKU students invaluable. Design is a completely different world in the universe of IT. Working together with designers learned me a lot about what is possible and how design materializes. I would never be able to do it myself, which is perhaps the reason why I value this experience so high. For the team, I reckon I was useful as well. My technical knowledge allowed to team to make decisions and overcome problems that may have otherwise unnecessarily caused delays or lesser results. The team itself was a joy to work in. The team members are kind and joyful people with a passion for what they do. I’m glad I was placed in this team to give my contributions, and would wholeheartedly recommend other master students to do their experimentation project in such a collaboration. The experience of working together with people with such different perspectives and skills is something you will definitely benefit from in future projects. For this reason, I brand it invaluable. Advanced war technology has made it possible to harness the devastating power of the orbital Ion Cannon into the Portable Ion Cannon. This weapon can, unlike its predecessor, be used indoors to vaporize your enemies. 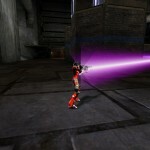 This weapon is inspired by Mr. Evil’s Personal Ion Cannon for UT2003. 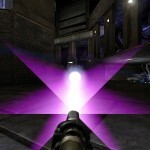 It was however incompatible with UT2004, which uses different code for the Ion Cannon. I programmed this weapon so that the Ion Cannon can be used indoors, and I must say that the result provides a very gratifying experience. Who said you can’t use Ion Cannons indoors? This weapon was created for the purpose of using it in specific maps. Instead of using a seperate file, the weapon is included in the map’s file for the sake of convenience. If you wish to use the Portable Ion Cannon in your map, please download one of the above maps and open it in the Unreal Editor. This will load the weapon in myLevel. Then, open your own map and use the weapon in your map, and the weapon will be included in your map’s myLevel. This mutator was made to fix an inconsistency with the AVRiL, which, upon firing, only applies a knockback to the player when he’s playing offline. Loading this mutator will make the knockback apply to online play as well. 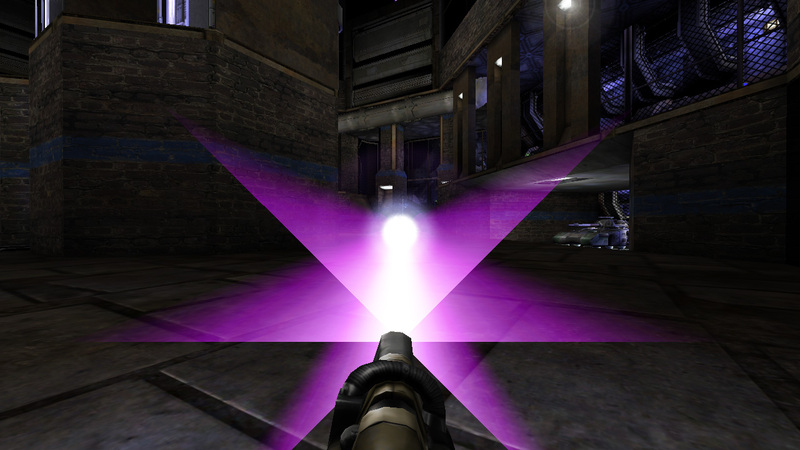 The mutator features an option to only apply a knockback when the play is mid-air, to prevent him from being knocked off of ledges. The above video shows that this mutator can cause gameplay balance issues. I refer you to the release thread on Vehicle Masters for discussion on this subject.